That’s the question we posed last week. And we got great responses – wisdom from the crowd! Let me share some of that wisdom with you. No, servant leadership cannot be taught. No, servant leadership cannot be taught, because servant leadership is grounded in a desire to serve, to serve first – one either has that desire or one does not. No servant leadership cannot be taught; servant leaders are born, not made. No servant leadership cannot be taught, but servant leadership can be uncovered. No servant leadership cannot be taught, but servant leadership can be revealed over time. No servant leadership cannot be taught, because servant leadership is only found through self-discovery. Yes, servant leadership can be taught. Yes, servant leadership can be taught, but only if the teaching is followed by practice, practice and more practice. Yes, servant leadership can be taught, but servant leadership comes more naturally to some than to others. Yes, servant leadership can be taught – by example. 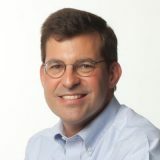 Yes, servant leadership can taught, but its cardinal virtues – generosity, foresight, and especially humility – are not easily learned. Yes, servant leadership can be taught, but only if the learner is committed to studying it. I want to think about our question a bit more – and listen more, too. I’m sure there is more wisdom to be heard! I’ll revisit this subject and post again about it before the end of the year. What do you think? 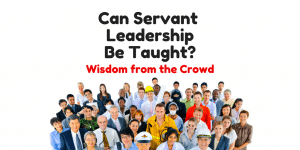 Can servant leadership be taught? Add your answer to the original posts or share them below. * I would be remiss if I did not remind you of a couple free resources from Cairnway. First, our latest ebook, Servant Leadership in the Workplace: A Brief Introduction. Of course it can be taught but its based on the openness of the student and the patience of the teacher. In most cases, it’s just easier to be directive. Servant Leadership is hard. Success seems to make it harder to be humble when it should be easier. If you can’t get past the first rule of Servant Leadership, “first be humble”, you are likely to quit before achieving understanding.